Although not exclusively affluent today, “slum” is not how one would describe its quiet unassuming streets lined with elegant Victorian homes. The easiest place to start is at Carleton and Parliament. Take the subway to College station. You can wait for the eastbound streetcar here, but as any Torontonian that has waited for the 506 will mutter under their breath, you may as well walk. On the way you can stop at Daniel et Daniel (284 Carleton), famous for catering, but also offering display treats for purchase. Once on parliament, turn right, and then turn left on Spruce. This is a portal into a different world. The cacophony of car horns and human traffic fades exquisitely to black. Instead, encounter red and yellow brick houses, wrapped in ivy that reaches thorny fingers into all crevices, draped in the sound of the chatter of school children homeward bound. 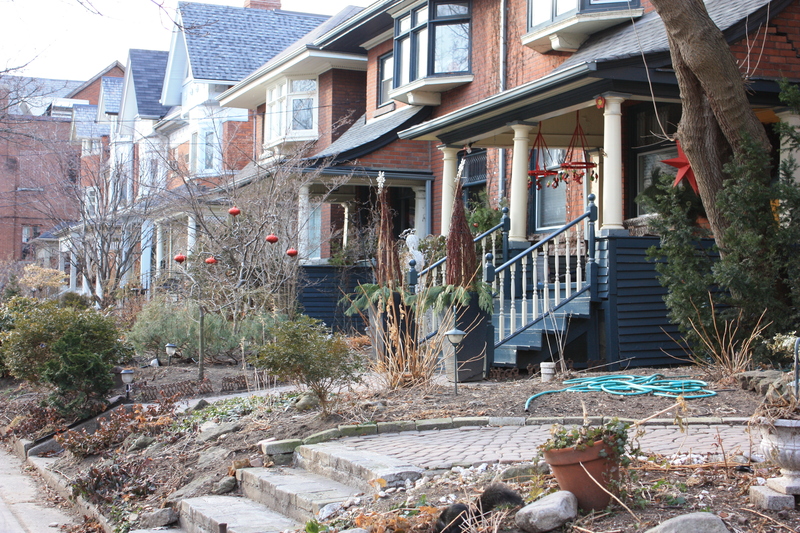 The neighbourhood’s name comes from the vegetable that Irish immigrants used to grow on their front lawns. Today many homes proudly bear the flag adorned with the little green vegetable. Between Rolston and Sackville you will walk past Trinity Mews, the old Trinity College Medical School. If you turn south on Sumach you can see the former Ontario Medical College for Women (289 Sumach), which are now condominiums. The former Toronto General Hospital site is here as well. Turn and head back north on Sumach, to Riverdale Park West, where you can relax on a bench and watch families play with children and dogs. It borders Riverdale Farm, originally Toronto’s first zoo. Due to cramped conditions, not ideal for a full-scale twentieth century zoo, the animals were shifted to the Metropolitan Toronto Zoo in the mid 1970s. The Riverdale Zoo became a farm, focused on animals such as horses and fowl. Behind the zoo you will find the Necropolis Chapel and Cemetery. The chapel, designed by Henry Langley in 1872, is built in a Gothic Revival style. The Cemetery was opened to replace Potter’s Field, formerly at the corner of Yonge & Bloor. It houses many of Toronto’s most famous dead such as William Lyon Mackenzie, the first mayor of Toronto. Cut back West on Winchester, till you reach 94 Winchester, home of Doug Hemming, former magician and teacher. He was most oddly known as a senior political member of the Natural Law Party, primarily known for their belief in human flight. At Metcalfe you will find the former St. Enoch’s Presbyterian Church, now the Toronto Dance Theater. Go west till Parliament, turn right and walk up past Bloor to St. James Cemetery, the oldest cemetery in Toronto. Much like the Necropolis, it plays host to the remains of many famous deceased Torontonians, such as E.J. Lennox, the architect who designed the old City Hall and Casa Loma. As you walk down Parliament there are a variety of places you could stop and refuel after your adventure down memory lane. Pear Tree is a dimly lit brick-walled restaurant that serves brunch till 4pm on weekends. They boast 9 different styles of Eggs Benedict with different twists, and prepare their hollandaise sauce fresh. During the week, they also serve sandwiches, pasta and a variety of entrees. House on Parliament is known for pub fare and weekend brunches, notably the pulled-pork sandwich. This joint has a softer cozier feel than many of the chain pubs throughout the downtown core with rich red velvety curtains shielding the door and a lively patio in the summertime. Not hungry? Try Jet Fuel, a cozy little coffee shop, marked by a blue and red rocket outside. There is no menu here; the barista jokes that you tell him what you want and he’ll either say yes or no. With dramatically red walls and homey wooden furniture, it is ideal for unwinding, reading the paper or warming up on a cold day. If you’re not feeling that adventurous, fear not there is a Starbucks and a Tim Hortons within blocks of here. 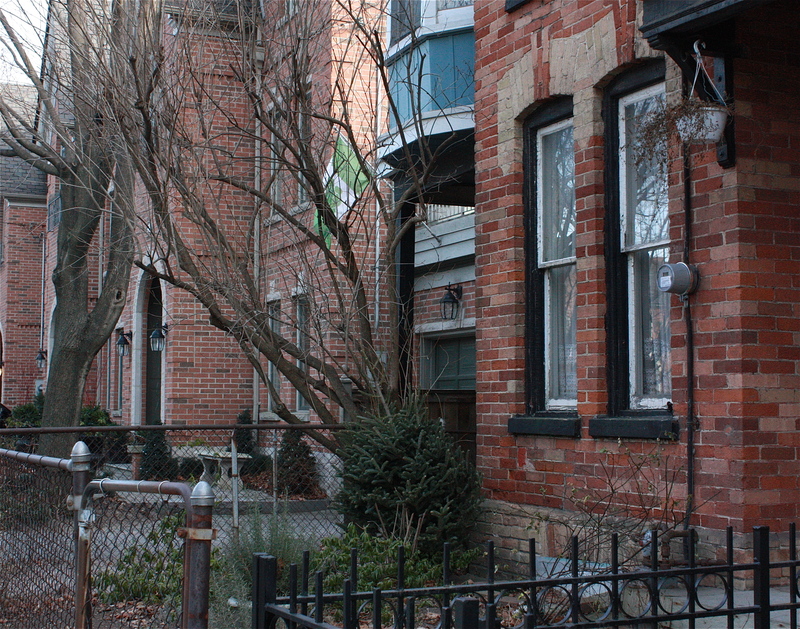 Cabbagetown is an off-the-beaten-path alternative to the likes of the CN Tower and it’s snail-paced rotating restaurant. It is neither over-priced nor over-hyped. It is a different way to experience Toronto, and to engulf yourself in it’s not so distant past, what it used to be, what it is now. 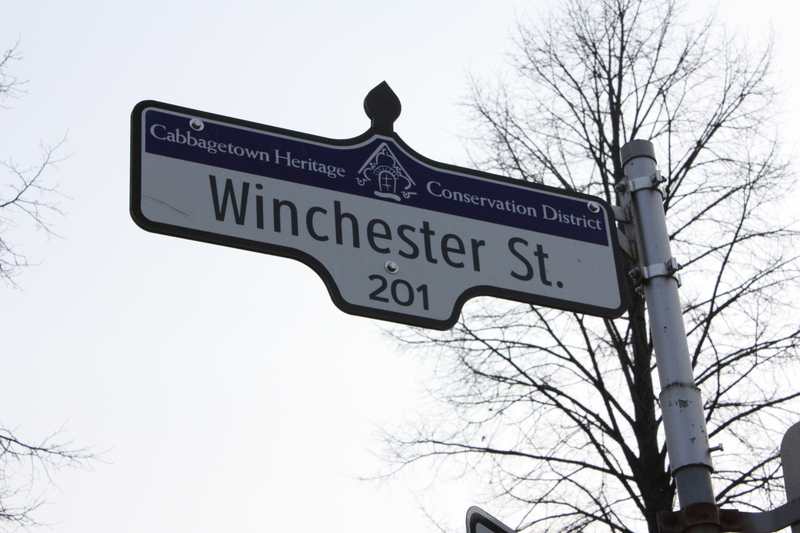 A casual stroll through Toronto’s heritage. Thank you for the kind words about our neighborhood. I would love to feature your article on my blog. Absolutely – I would be honoured. Thank you so much for reading. It is a wonderful neighbourhood, and I thoroughly enjoyed writing about it.